Posted in Cool Stuff, Fun Facts, Tech Stuff, Tips and Tricks, Troubleshooting. Why do we get less formatted capacity than expected? The answer is simple. The “lost space” is reserved for the file system as well as the device’s operating system/device information if it exists. When we buy a data device (a USB Flash drive for example), we expect that it can hold as much data as the design data capacity printed on its label and packaging. After some time upon opening its packaging, we get disappointed that it can’t hold as much data as we expect them to be. In the end, we might have regretted that we might have bought another one. What formatted capacity will I get from buying a 2GB storage device? From my experience, buying a 2GB USB Flash Drive won’t give you a full 2.00 GB of free storage, but instead, will give you 1.86GB worth of data storage when formatted with System 32 file system. Some of us might thinking that the manufacturers might be tricking by not giving us a device our money is worth for; however, most of us accept this fact and mind nothing about it. Is it possible to get that full capacity? If you think getting that full capacity is possible, its possible. However, it will be just a plain unallocated space and will be unusable by any system. Moreover, it’s useless unless it is formatted. Therefore, manufacturers are deceiving me? ** 1GB = 1 billion bytes; actual formatted capacity less. I understand, what will they do with that missing space? As what is said in the beginning of this article, here are the following reasons why that “missing space” is reserved. A. It is reserved for file system that device is formatted with. A file system use indexes where they store information where your files and folders are located in a disk or drive. It also serves like a card catalog inside a library. You use it to locate books and information easily by going directly into its designated shelf and location. If you remove the card catalogs or computer-catalogs inside a library, you will have difficulty in finding a particular book by manually looking at every book present in a library. Plus, it’s a time-consuming behavior. Same applies to a disk without a file system or catalog system. B. It is also where some manufacturer and device information is stored. Some of its stored data include the manufacturer name, product type, kind, model, part number, serial number, hardware id, and a lot more. Windows and any other operating systems use this information to determine which device drivers and services are to be launched. Once a communication between your device and the computer is established, you can read, write, modify any of its contents and format it. Manufacturers also use this information for verification that their software designed for that device will work perfectly with your device. If any of these information is not present or read properly. Windows will report a “USB device not recognized.” error message. C. Is is where the device operating system, system files and reserved space are stored. If your device is designed primarily for storing data only and nothing else, most probably is that it doesn’t a reserved operating systems. These data storage devices include some USB Flash Disk, CD, DVD, BD, Hard disk, SSD, memory cards, memory sticks and picture cards but they still possess other reasons above. Data storage devices that come with an operating system include mobile phones, portable media players and other gadgets. So, having an 8 GB capacity iPod Touch will leave you with 6.5 GB remaining free space while having a 32 or 64 GB of it will leave you 29 and 59 GB of free space respectively because iOS is reserved has reserved some space besides reasons above. Manufacturers store data in this location because it is secure and cannot be deleted or modified easily in case the user formats or erases the disk. Some manufacturers have other reasons why they reserve some of your disk’s capacity. One reason is for recovery space partition. You will not see that recovery partition appearing in your Explorer or Finder window because the manufacturer don’t want you to make changes into it. Even it does not show up, it occupies your hard drive capacity. This recovery partition is very essential especially when something goes wrong with your computer. You can make a fresh install of your operating system from it or use it to restore it to its out-of-the-box factory default. Which of the following scenarios have you ever experienced? I keep on getting viruses on my USB flash drive and my computer. I occasionally lose my important files. My flash drive is not enough to carry all my files with me everywhere I go. I don’t like the feeling of plugging and unplugging my device especially to untrusted computers. I don’t want my sensitive data to get into the hands of an strangers. I want to save and retrieve my files to and from the internet anytime and anywhere there is internet connection. If that is the case, it’s time to move “To The Cloud”! Technically, when we hear the word “cloud”, we can think of masses of tiny water droplets floating in the sky. In terms of computing, it refers to the servers in the back-end of the internet which allows you to access and retrieve your e-mail, applications and data from their servers. 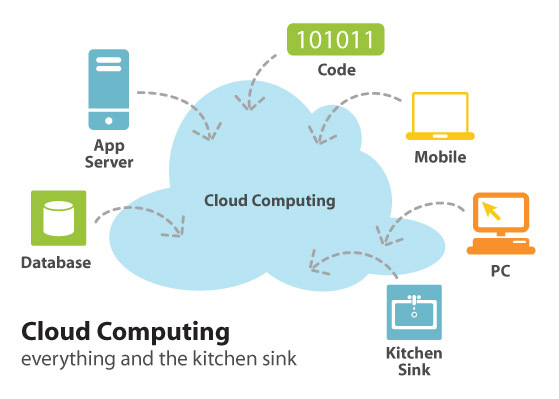 If you recall what have you learned about water cycle back then, you might come into conclusion that Cloud Computing actually works like that! First, water vapour from the streams, valleys and oceans including the one that evaporates when you dry your clothes under the sun evaporates in to the atmosphere. These tiny water particles join to form clouds. As the cloud gets heavy enough, it condenses to make rain. These water particles go back to earth in the same or different place. Finally, same process repeat itself over and over again. Similarly, cloud computing works similarly. Imagine your files can be compared to water in a basin. This files break into smaller packets as it is being uploaded into the cloud server. The cloud server then joins these packets together to form the original file. As the need arises, you can download the same file. The server breaks again the file into packets which will be sent into your computer. Finally, your computer collects these packets to form the original file. You can download the same file over and over again. How do I store my files into the Cloud? First of all, you need create an account from a service provider. There are a lot of cloud services in the internet you can choose from. These services range from individual user to small business to large enterprises. Prices vary according to your needs from free to a monthly or yearly fee. Some popular cloud storage services are Dropbox, Box.net, SugarSync, GoogleDocs, MobileMe and Windows Live Skydrive. It depends on your choice and needs. 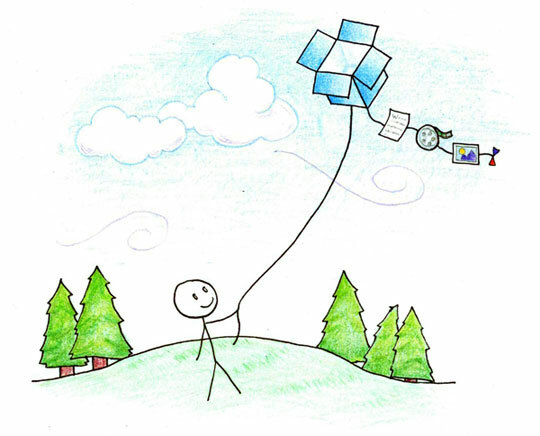 In this article, let’s start with Dropbox. It is one of the most popular on-line cloud services besides of its easy to use interface, convenience and price which is free. First of all, you need to create an account. Visit http://www.dropbox.com to get started. On the upper right corner of the screen, click Log-in. From the drop down menu, choose Create an Account. Enter your personal details on the boxes provided for like First Name, Last Name, Email and Password. It is recommended to create a hard-to-guess password to protect your data and your online security. Once done, hit the Create Account button to continue. You will be asked to download and install its desktop companion but it is optional. You will be directed to its main interface to help you get started.